“She Was Beautiful Even Though She Was Dead,” the first solo release by Compton-based, Blue Jungle frontwoman, Lately Blu Blu, is a shot of absinthe – slightly sweet, but heavy and undiluted; an emerald green reminder of the dark side of life. “She Was Beautiful Even Though She Was Dead” is a mimosa on the deck at sunset, ethereal and relaxing, the perfect accompaniment to a life that isn’t as bad as we sometimes think. Wait, wait. Let’s try this again. “She Was Beautiful Even Though She Was Dead” is… ah, whatever. It’s pretty tough to holistically describe this disc, a mix of funereal moaning and acoustic guitar-heavy celebrations. Like a bipolar bartender, Lately Blu Blu starts by serving up the sort of goth-folk tracks you’d listen to while driving to the cemetery or taking a tub in gin, then skips on over to put-on-a-peasant-dress-and-braid-your-hair folk, the type of thing Fiona Apple would pick if she finally decided to get out of that bathtub to go lay in a field. “She Was Beautiful” features lamenting, then lilting, tracks featuring Lately’s distinctive voice and understated acoustic guitar. Production-wise, it sounds a bit like it was recorded in a bedroom, but that seems to be her style: Celebrating the mundane, unglamorous parts of living. Despite a few bright spots – Prozac-infused pauses where Lately chooses glad over glum like “Alma Take Two” and “I’ll Do It Again,” the perfect songs to listen to at twilight or, even better, during a sunrise that comes after you’ve stayed up all night –it’s clear that this girl has either just left a funeral or would really love to be at one. 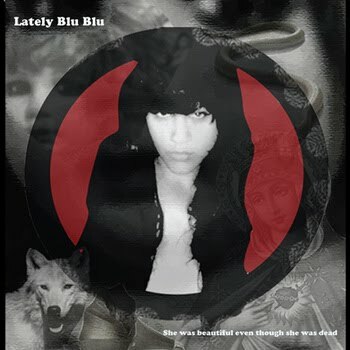 From the twisted-lullaby feel of “Poor Lil Jessica,” a disjunctive choice for an album full of sweet (or at least sweet-sounding) tracks, to “Lousy Liars,” one of the disc’s high points, Lately Blu Blu waxes negative, calling attention to the sorts of awful things Emily Dickinson only dreamed of experiencing. It’s clear that Lately Blu Blu, though she sports a midnight-colored bob and sings in a band with a guitarist named Nosebleed, has listened to her share of Lucinda Williams and Patty Smith, the cowboy-booted queens of musical sob stories. Popular wisdom says it’s not good to mix drinks, but here it’s more perfect-buzz intoxicating than falling-off-the-curb drunk-inducing. If it weren’t for brief lapses in the disc’s depressing moments, like the perfect piano-guitar combo of “KEVIN,” listeners would be sick of Lately’s music within two tracks. Like the singer’s cheerfulness, songs wane quickly, averaging two minutes with some as short as 56 seconds. Just when a bit of drama would be the perfect foil to her cover-the-windows-in-black downers, the way Queen’s “Who Wants to Live Forever?” benefits from Freddie Mercury’s falsetto about two minutes in, the song ends, which is a letdown on most tracks. Dark as a shot of aged whiskey but as feathery-light as a good chardonnay, “She was beautiful before she was dead” is a good effort, though one that would benefit from a bit more May Day and a little less Halloween.